Was hoping for no Russian team, but I'll take it. This must be EL draws, right? Because you can't possibly get that many soft "opponents" in all those draws. Not without hot and cold balls. @1000dB United except this year and '15 I think has always been in pot 1 and that pot normally easy to teams, Plus Roma '07 squad and Valencia '10 ain't easy. What I can see United like drawing a Portuguese side. Oh yea right, top seeds only are drawn into soft groups and never a group of death. Being in pot 1 doesn't mean you get an easy group every year for a decade, sweetie. United don't get easy groups all the time, might be easy on paper but can sometimes not plan out that way. Remember the famous CL of 99 when United were in the group of death and only top team qualified, United and Madrid qualified as best runners up. Haha this is glorious - having to reference back to 18 years ago. Utd always get an easy draw. That's very rude, mate. There's no need to be this upset. Besides I'd rather watch CL worthy ties than wade through Manure in what's basically an EL group. Mahrez to United? Wouldn't be unthinkable, and let's face it, he is quality. Would definitely improve the attacking options, and as it stands United don't have a left-footed through and through winger. Chelsea and Barcelona seem to be leading the race though, and I'd rather see him join the former than leave the Premier League. Bailly at fault for the first goal; Jones at fault for the second. Bar that, one great save by De Gea, but a tepid defensive performance. Even Valencia, who is usually solid, looked weak and unsure against an albeit fantastic Choupo-Moting. Darmian faired reasonably well against Shaqiri, but offered very little going forward, and that basically made it very easy for Stoke to defend. Not sure how Lindelof would have done today, but Mourinho should have played Blind, who has been great so far. Lukaku was poor, but not as poor as the red torch in the midfield. Another bunch of misplaced passes and failed tricks by the man who has had more haircuts than good games in a red shirt. Good game, nothing out of the ordinary, but great to see Lindelof put in a solid performance. Young was outstanding, and Blind did a pretty good job on the left too. Smalling was decent. Fellaini deserves a mention as well, as I think he did a great job filling in for Pogba. Obviously hoping that the latter's injury isn't serious, but I wouldn't be worried with the likes of Carrick and Herrera also being options. Young MOTM, Fellaini close second. People critical about what Pogba brings, but that game shows United need Pogba as Pogba loves to get the ball and control the game. LB Spot an issue for United, Need a perm LB. Man United make record revenue of £581m and £81m profits for their annual figures. United Debt has dropped for £261mil to £213mil. Part of me wishes they would just wipe the whole thing out, but as long as it's being managed properly we can't complain. It's been steady for as long as I can remember, so like you say there would be no real need to erase it in one go. Should add that Facebook and Amazon seem to be showing serious interest in securing the TV rights for the next PL season, which would only make the said revenue larger. Dreadful performance today; Southampton will feel like there was something to be taken. United losing every midfield battle from the get-go, with negative passing to be seen once again. Whenever someone did try to pass the ball forwards, it was either misplaced or intercepted. Mkhitaryan and Rashford poor, Mata completely out of the game and the Matic-Fellaini combo very shaky - hate to say it, but Pogba was missed today. Lukaku might have done all he could today, but with few good chances missed, and the opportunity to play it into Fellaini on the counter not taken, he shows once again that he's lacking the intelligence of, say an Alvaro Morata. He'll get goals in this United team, but more often than not it's incredibly frustrating to see him be clumsy and unaware of what is going on around him. Despite this though, no mention-worthy save for De Gea, and another clean sheet to report. Not the best performance but Mourinho brought in Lukaku to turn draws into wins and that's what happened at the start of the season, scored 6 in league and 2 Europe. Mourinho said, Attack didn't look sharp today, not sure why but he knew if he parked the bus n got a clean sheet, its 3 points as Southampton went more direct so he made it a back 5 with Smalling. 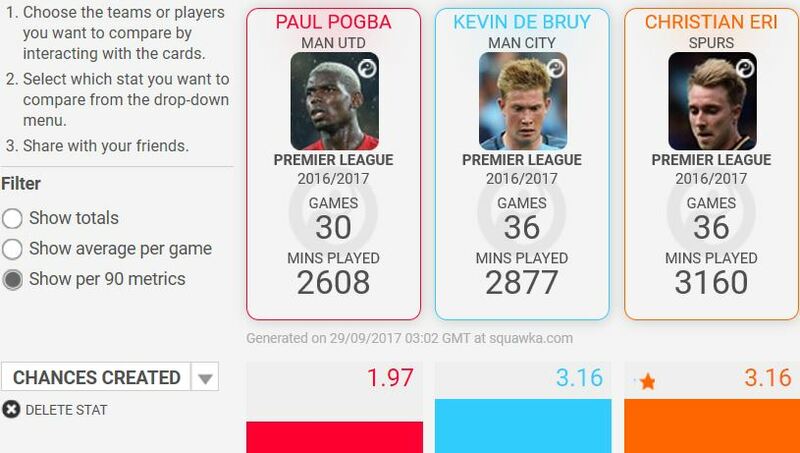 Pogba is incredibly wasteful though. You're right in saying that he loves to be on the ball, but more often than not he loves it a bit too much, and ends up doing something stupid to concede possession. Though today Matic and Fellaini didn't quite cut it - too static, and perhaps too prudent in their style of play. Shaw might have to wait for some time going by Mourinho's latest remarks, but I agree that a fixed left back would sort out any defensive instabilities. Valencia was all over the place today though. You say Pogba wasteful but last season he created the most chances in the league even know only few were taken. Pogba has strength to keep the ball and at time dictate to others where to pass, can turn defence into attack by 1 pass and joins in the attacks. He is badly needed for the reasons I think even if he concedes possession once or twice a game. Zlatan missed the most big chances though and if you recall that Sky "article" Lukaku had an insane big chance conversion rate. IIRC over 60% while other PL strikers only managed half of that. Koeman, Martinez and Henry giving Lukaku plaudits for his clinical finishing isn't unwarranted at all. @AniAniAni Lukaku has been carrying the one-trick pony moniker since his Anderlecht days. If that one trick is scoring lots and lots of goals he'll have a great future nonetheless. He has scored plenty outside of the PL, e.g. EL top scorer a few years ago, but let's look at how he did in the PL. Lukaku's tally of 91 PL goals is impressive. He's already outscoring the likes of Bergkamp, Cantona, et al. while this season he'll most likely overtake the likes of Drogba and Van Nistelrooy and if he spends his career playing in the PL he could break Shearer's record or at least he's well on his way to end up very high on the all-time top scorer chart. Lukaku's goal-scoring record in the PL is even more impressive when you consider his young age, that he didn't see PL action in his first year (would have already passed the 100 PL goals mark had he been loaned out seeing he scored plenty the year before and after), that he was loaned out on deadline day in 2 seasons (having to adjust to a new team at the last possible moment), that Lukaku was feeding of scraps at WBA and Everton compared to Kane at Spurs for example (even though Eriksen didn't have the most assists last season Spurs created the most chances), etc. Also, he provides a lot more assists than the likes of Kane. Lukaku has 48 assists (35 in the PL) v. Kane's 15 in the PL. Not bad at all for a so-called poacher. At least Lukaku dares to leave his comfort zone. Yet I can't really blame Kane for enjoying the great service he receives.